Chad (L) sharing his knowledge with the students (R). This is Carey with some updates from the YEA Corps program at Unity high school in Minneapolis where YEA is teaching sustainability and entrepreneurial education. YEA Corps is a month into our school programs, and recently we took students on a field trip. We got to the Unity campus last Wednesday prepped and ready to bring students to the Urban Farm Project. The first thing I heard once we got to the school was a couple students making jokes about churning butter and petting the cows at the ‘farm’. This was pretty funny, because there would be no cows, no farm animals, and no butter churning on this farm visit (although that would be fun). The Urban Farm Project is not your classical farm on the countryside. The Urban Farm Project is a for-profit operation in South Minneapolis that produces perch and a plethora of fresh vegetables, and they grow all of this through aquaponics systems in a large converted warehouse space. A few students were tempted to reach in and grab a fish. Our visit was a perfect opportunity to show the Unity students an example of a successful group selling produce and fish through aquaponics. 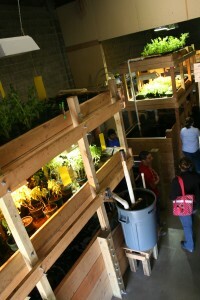 The students will eventually create their own business using aquaponics, although on a smaller scale. Chad heads the operations at the Urban Farm Project, and he shared his wealth of knowledge about aquaponics with the students. 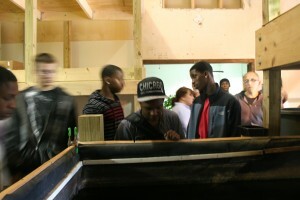 The best part of the visit was when the students were able to walk around and observe the fish tanks and vegetable beds. I think aquaponics is best understood when one is able to see a system and the field trip was a great way to show students the agricultural systems that they will build all on their own. Like Chad, the students will consider how to design the systems, what produce to grow, who they will sell to, and how they will market their products. The Urban Farm Project and the Unity Project are ventures in urban agriculture, and both initiatives are paving the way for our future food systems. 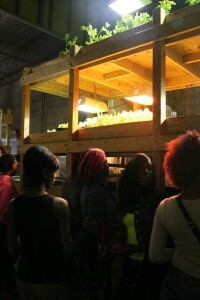 Students checking out the fish tanks and veggie beds. We would like to thank the Urban Farm Project for their generosity and for showing our program and all of the students from Unity a great and educational experience! The field trip was an eye opener for the students and many of the students are now really excited and engaged to continue into the next steps of the project – with the reality only starting to seep in that eventually THEY will be building and managing their own aquaponics business! This entry was posted in Alumni Spotlights and tagged aquaponics, education, sustainable community organizers, twin cities by rubylevine. Bookmark the permalink. that was a great idea to show the kids how food is grown!! !